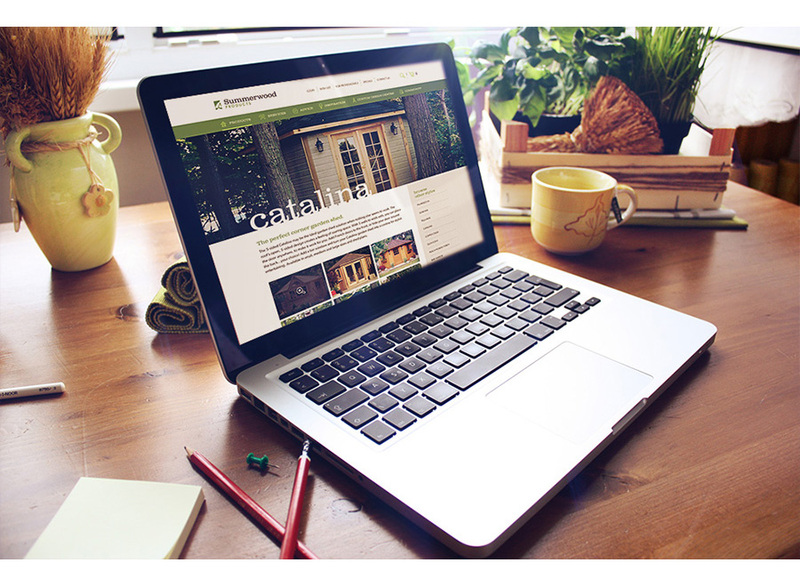 A new business-to-consumer website design that stirs up the sweet scent of sawdust. 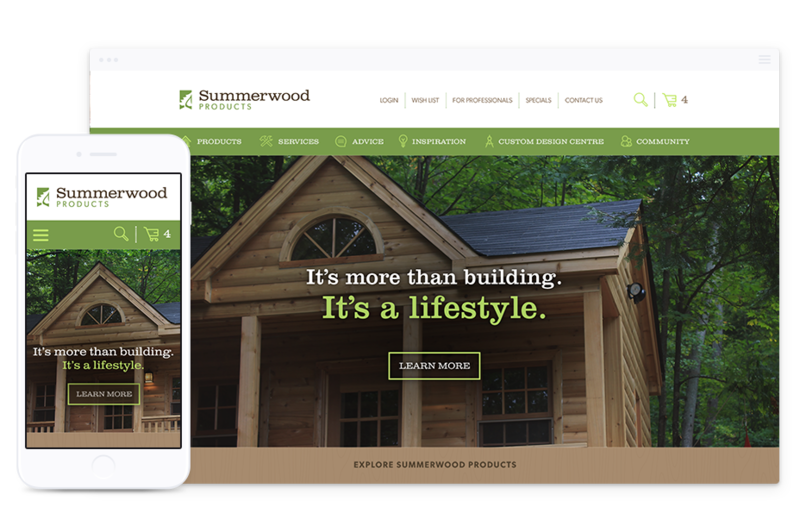 In their search for a Toronto web design company, Summerwood Products, a supplier of beautifully crafted wood building projects (from Cabins to Gazebos), approached Parachute Design through a referral from another one of our great earlier clients. Summerwood Products had taken the initiative internally and created some basic website wireframes in an effort to redesign their outdated and uninspiring business to consumer (B2C) website. Realising that what they do best is quality wooden craftsmanship, Summerwood initially engaged our Toronto website designers to provide art direction in a web design consulting and brand strategy role on the new B2C website, which was already in the works. However, following our initial consultation Parachute Design was given the keys and room to run with the web design, in order to create something much more intuitive and engaging. This is a vote of confidence we didn’t take lightly to say the very least, given their attention to detail and passion for great design. Given that we were tasked with web strategy and creative, but not website development or on-site search engine optimisation, our Parachute Design team had the opportunity to work with some great new web development and search engine optimisation agencies to put together the final product. Everyone on board was in agreement to step back and take a look at the existing website analytics and market trends before starting with a brand new set of wireframes. 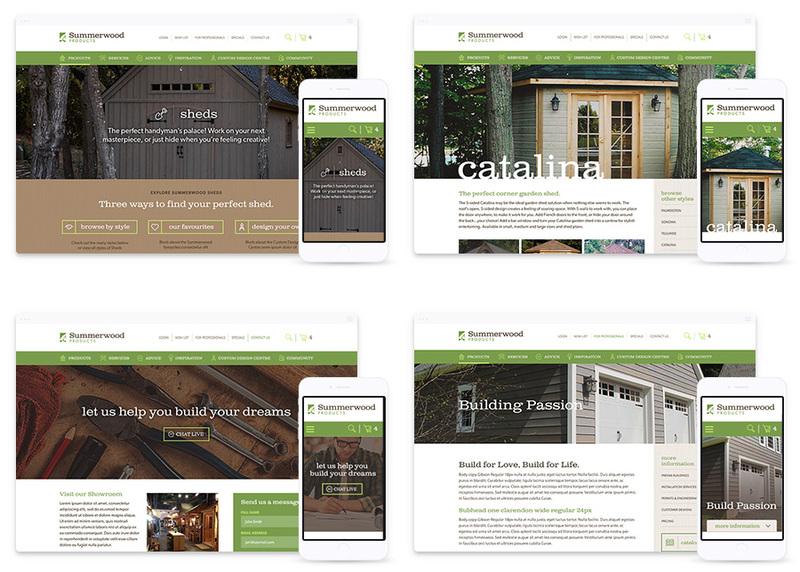 We circulated our new Summerwood Products web design strategy amongst all team members for input, and collectively, we refined the wireframe design until everyone was completely behind the new B2C website design concept and we were able to move forward with the design process. Our vision for the new website from a design and user interface perspective was fairly straightforward. We aimed to take advantage of the full-screen canvas available to web designer’s today, with the wide adoption of responsive website design. Thankfully, Summerwood Products has a very expansive and beautiful image library showcasing their beautifully handcrafted wood building projects, and it made perfect sense to take advantage of these images, and really captivate the viewer with bold, beautiful hero imagery. To support the vibrant product photography and reinforce the passion that Summerwood customers feel for handcrafted wood products, we incorporated subtle wood grain tones and textures throughout the user interface design, which began to tie all the individual pieces of each component of the website design together. As with many responsive website design projects we take on, there is often more than one type of audience we must appeal to, and Summerwood was no exception. Our Toronto web designers had to create a B2C website design interface and user experience that not only appealed to both professionals and do-it-yourselfers alike but quickly and gently guide each type of user into their respective section of the website. To achieve this goal, professionals are shown industry awards and high-end, individual building materials and tools quite quickly, while do-it-yourselfers are taken by the hand through virtual tours, inspirational material, and various sub-sections of the website offering building and design advice to help them build a vision for their wood building project. Taking the time to understand how each type of user browsed the previous version of the website was a key component of our B2C web design strategy and an element in measuring the success of the new website design. For those serious DIYers, we’ve even included a fully interactive custom design suite, fully reimagined for the responsive web environment. The online custom design centre, formerly a clunky Flash module, was completely torn down to it’s core and redesigned by our Toronto web design team to not only offer a faster, more intuitive and more complete experience on a traditional computer, but to also function more similarly to what we would expect from a mobile application that is fully responsive to tablets and mobile phones. 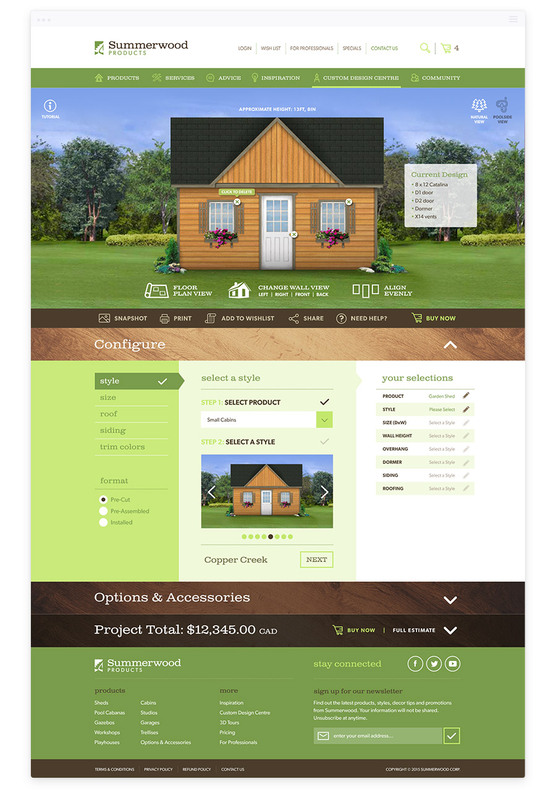 Now, whether the user is a professional or a first time homeowner, all the tools are readily accessible to design their own custom wood building project right down to the fine details, and when complete, simply click to order. Parachute Design has been creating handmade professional website design, logo design and branding strategies in Toronto, Ontario for more than a decade. Our creative web designers offer the experience and background our clients rely on when embarking on web design for B2C in addition to professional brand and logo design. Let our Toronto web design company help your business put its best foot forward with professional logo design, branding, and responsive website design for today’s knowledgeable online shoppers. For more information or to request a web design proposal for your next project, please complete our online quote request form, or call Parachute Design, a Toronto branding and website design company at 416-901-8633. We look forward to working with you! Creating a successful website design isn’t a DIY project. We have the experience to help you put together a plan to create a winning website, the first time.